You can’t miss that change in the air, and with spring just around the corner there’s no better time to think about refreshing your home. Minimalism is still a ‘thing’ but we’re moving away from soulless, contemporary schemes towards a more Scandinavian style focused on simplicity and functionality rather than mere uniformity. 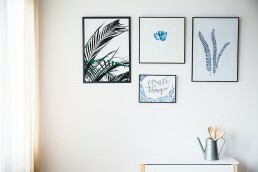 Tapping into the notion of home as a sanctuary, this trend recognizes that following fashions can be impersonal and unfulfilling so it’s all about injecting your own personality and style into your space. We’ll see a much more eclectic, mix-and-match look coming through, especially in kitchens designed to look ‘found’ rather than ‘fitted’. We’ve had our fill by now of grey, beige and greige – colour is back! For neutrals we’ll see more soft greens and violets as a way to bring the outdoors in, even in urban environments. There’s also a big trend for bold use of dark shades on walls – think inky blues, deep forest greens and even black if you’re brave enough. As the global consciousness turns to sustainability, the throwaway culture of the past continues to fade, and in its place we’ll see much more emphasis on artisan furnishings that are built to stand the test of time. For 2018, that means design that showcases the beauty of natural materials and also traditional craftsmanship – one look at the stunning natural timber and handcrafted joints of DINE Living’s tables will tell you everything you need to know! We LOVE this trend! 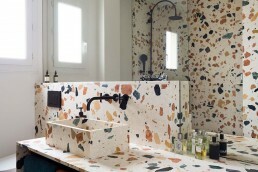 Terrazzo is traditionally a type of flooring created by mixing chips of marble, granite or quartz into a concrete base, which is ground or polished after it sets. It’s the perfect blend of industrial and luxe and you’ll be seeing it on everything from floors and walls to counter and tabletops this year. Don’t miss part two of our emerging trends post, coming soon!